Have you seen the skylights in National Statuary Hall? Did you know that Thomas Jefferson was the inspiration behind them? If you haven't seen them, you didn't miss them — the skylights haven't been in Statuary Hall, the former House of Representatives Chamber, for over 200 years. So long, in fact, that most people aren't aware they were ever there. If Benjamin Latrobe had his way, skylights would have never been in the dome over the old House Chamber. But Latrobe, the second Architect of the Capitol, couldn't overcome the unyielding will of the man who had appointed him: President Jefferson. Before his election, Jefferson had served as U.S. ambassador to France, where he joined excursions to sites of interest led by American artist John Trumbull. One such visit took this group to the Halle aux blés in Paris, a circular building capped by a wooden dome. To illuminate the grain market inside, the architects designed skylights that descended like ribbons of glass between the ribs of the dome. When he returned to the United States, Jefferson took a keen interest in the architecture and construction of the U.S. Capitol, writing regularly to Latrobe. In several letters, Jefferson wrote about his desire to include skylights similar to the ones he had seen in Paris in the dome over the House of Representatives chamber. 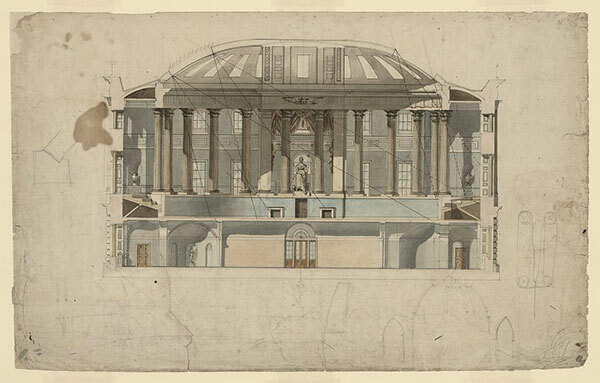 Latrobe drawing of the U.S. Capitol House chamber showing fall of light from skylights between the dome arches. Photograph retrieved from the Library of Congress. Latrobe, however, had many practical concerns, such as where the many beams of light would fall in the chamber. Would they adequately illuminate papers for members? Or shine in their eyes, blinding them? Frost would surely cause leaking between the 800 panes of glass the design required. Hail would break them, if "careless servants" clearing snow from the roof didn't. Even if the glass didn't leak, condensation would drip from the cold glass into the House chamber. Jefferson didn’t reply, leaving it to Latrobe to decide whether to drip icy water on representatives or disappoint the president. Unable to reason with Jefferson, Latrobe created a compromise of many separate square panels of glass, which could be sealed and protected from hail — or so Latrobe hoped. This would achieve the effect Jefferson so passionately sought and avoid the difficulties Latrobe foresaw. However, all the skylights came to an untimely end that had nothing to do with cold. Quite the opposite, in fact. Around 8 p.m., on the evening of August 24, 1814, British soldiers marched into the House of Representatives chamber, stacked the furniture into a tower, slathered it with gunpowder paste and ignited it, liquefying an architectural legacy of Thomas Jefferson. What the conflagration melted were skylights in the dome over the House Chamber that Latrobe had included in his design after repeated requests from Jefferson. When Latrobe returned to the U.S. Capitol after the fire, he reported, "So intense was the flame that the glass of the [sky]lights melted, and I have now lumps, weighing many pounds of glass." Latrobe had been called back to Washington, D.C., to rebuild the U.S. Capitol after the fire. Most of the building was a gutted shell. This time, without the president who appointed him looking over his shoulder, Latrobe created the neoclassical masterpiece that we now know as Statuary Hall and replaced the skylights with a traditional ceiling design. But Jefferson's vision didn't disappear. In Baltimore, Latrobe recreated Jefferson's skylights that descend in ribbons through a dome in his design for America's first cathedral, now known as the Basilica of the Assumption. Above the altar, Latrobe placed the skylights in the upper dome so that the light flowed into the church through a central opening in the lower dome. This created a lumiere mysterieuse, or mysterious light, that appeared to hover over the altar. After a building is destroyed, it's impossible to experience the unique spaces created within them that are lost. However, it's still possible to see the light that inspired Jefferson in Paris and that he had Latrobe recreate in the U.S. Capitol. But it's a mystery why, after all his protests, Latrobe included such a problematic element in the Baltimore basilica. Perhaps he created a clever solution for the many pitfalls he foresaw. Or the strength and clarity of Jefferson's vision finally enlightened him. Or, perhaps the reason is yet to come to light.